If you want a fun t-shirt dress that brings in lots of color and darkness then you want to see this. The t-shirt dress has black sleeve and the back is completely black. 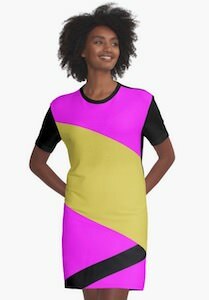 The front of the dress has bright purple on both the top and the bottom and there is a yellow area in the middle and a black stripe close to the bottom. A t-shirt dress like this is fun and could be the dress you are going to favor over all the other once this summer. 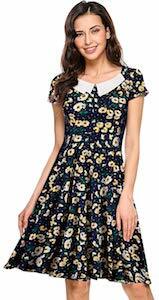 You can get this colorful dress in women’s sizes Small – 2XL for the perfect fit you want.